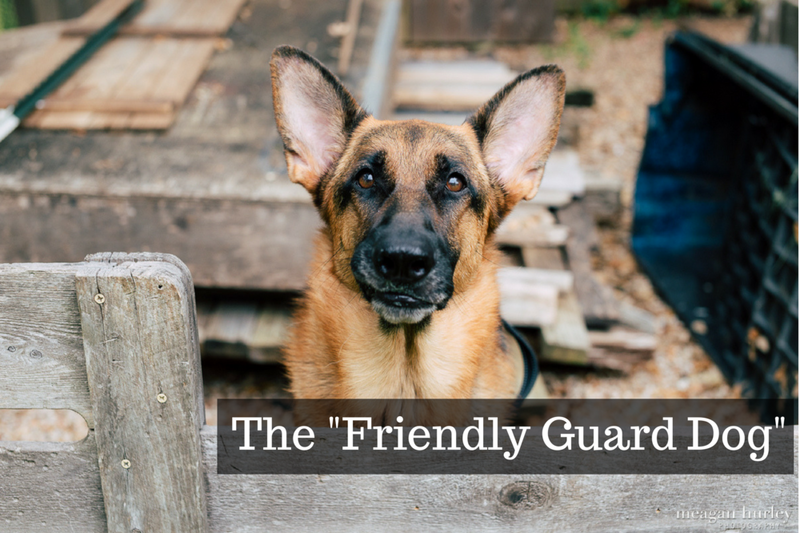 I've met a number of owners who want a "Friendly Guard Dog." They want both the protection and friendship that dogs offer. He should be loud enough to scare away the dangerous strangers, but friendly enough to welcome guests. Possibly. The first step is to determine where the naturally-occurring barking is coming from. Is he neutrally alerting, or fearfully reacting? Neutrally alerting dogs can usually be easily called away and redirected to another activity. Fearfully reacting dogs cannot "let it go" and remain mentally on edge even if they're quiet. At Koinonia, we affirm and prioritize the emotional aspect of a dog's quality of life. We want canine family members to be comfortable and confident in the world. The barking of a fearful reactive dog is an expression of fear or discomfort about the Stranger. Novelty is a frequent cause of fear for dogs, and strangers are novel people. Since chronic fear and anxiety creates a poor quality of life, we work very hard to associate strangers with feelings of pleasure instead of fear. Dogs who enjoy strangers are more likely to safely welcome guests into your home. What does all this mean for the Friendly Guard Dog? When a client brings this topic up, the first things I tell them is that the dog who alerts to people on the property, but is also friendly to guests who enter the home must have a bomb-proof temperament to begin with. If his temperament leans toward fear/anxiety, the barking is more likely a fearful expression. To encourage the barking on the one hand while teaching him that guests are wonderful on the other will be counter-productive and the fear is likely to win. A decision must be made about which behavior is more important. At Koinonia, we must prioritize resolving the fear because it will likely lead to a bite. "What if the barking is more important to me than my dog enjoying strangers?" The protection element can be a big priority for some, however, it's important to remember that fearful dogs aren't good judges of character. Leaving the barking alone in a fearful dog means that they will bark and pose a bite risk for all strangers. They don't know the difference between young Tommy's friends from school and the thief breaking in to steal electronics. Management protocols can be installed, but management always fails. It's not a of if, but when. Someone leaves a door unlocked; the dog jumps an expen for the first time; a friend comes over unexpectedly; etc.